The USPTO’s web interface could use a UI makeover. The second thing that the consultant would notice is that there is no centralized search for these four sites. And in some cases, no full-text search at all. 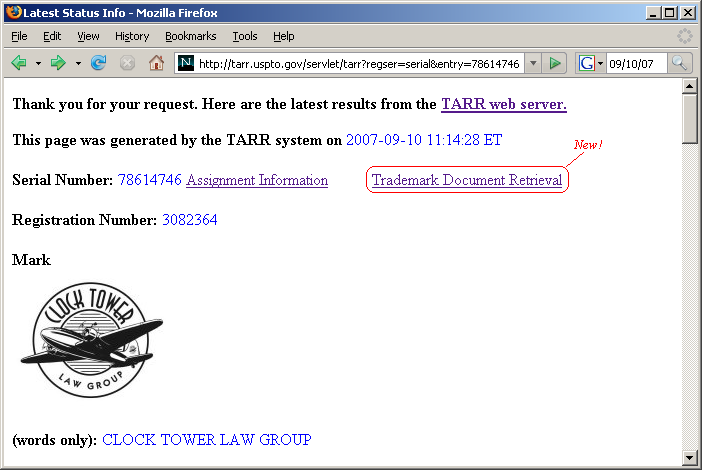 TARR is searchable via TESS (Trademark Electronic Search System). But of course. TDR supports only limited searching. You can search for documents by application number, but you cannot search within documents for text. If TDR used Google for it’s search engine, then you could search for “likelihood of confusion” to find trademark applications where that phrase was mentioned, but no text search exists within TDR. And TDR is not indexed by Google. So it’s nearly useless. TTABVUE support searching for words anywhere in a record. The (Unnamed) Trademark Database supports limited searching (like TDR). Status – This is what TARR does. Pulls status from other databases and presents it in a simple one-page format. Application – TDR documents the trademark application process between the applicant and the USPTO examiner. Appeals – A much better name than TTABVUE (TTABVIEW?). The Trademark Office is about five years ahead of the Patent Office in terms of automation and electronic filing (e.g. the Trademark Office supports static URLs, the Patent Office does not). But the Trademark Office is about ten years behind the Internet’s worst search engine in terms of ease of use. I’m always amazed at how the USPTO’s public-facing web pages change with little or no public notice or input. This latest change is a baby step in the right direction, but it happened in a vacuum. Can you imagine if Google launched v17 (or whatever version they’re on) of their search user interface without telling anyone? That’s what the USPTO routinely does. Dear USPTO: Don’t outsource patent searching to private patent searchers or foreign patent offices. Outsource your search engine to Google 1997. Another weekend update breaks millions of static URLs. Hear hear. The SEC’s Edgar database needs the same treatment. TARR at least allows for sophisticated searches. Edgar doesn’t at all- one has to pay outside search companies to get at data meaningfully. I hope the SEC at least get decent revenue from the search companies for it- though I’d much rather see the database open up completely.